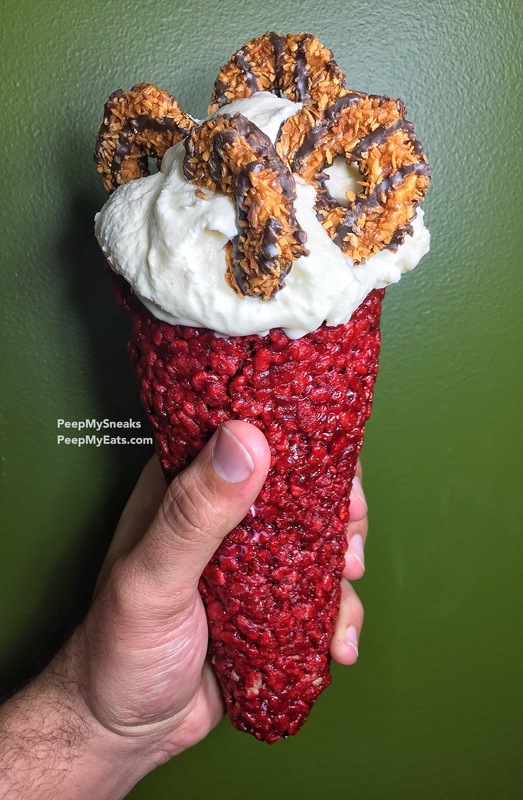 Red Velvet Rice Crispy Treat Cone! Got everything? Cool lets get started! Throw in your rice crispy and mix in until all your cereal is evenly coated. You are going to want to work fast before it cools so it’s easier to shape. spread out in a pan, you want to cut sort of a triangle shape out of your rice crispy. Take aluminum foil and make a cone shape. You want to wrap your rice crispy around the cone shape to keep it from folding in on itself. Cool in your refrigerator for 10-15 mins and boom! That’s it now fill it with any ice cream or toppings of your choice and enjoy! I went with vanilla ice cream & Girl Scout Samoa cookies! Here is a quick 15 sec video showing you all the steps! Previous postRed Velvet Caramel Cake Balls!